System protection - ICEZEIT The coolest place in town. Sufficient system protection for the trademarks used is of particular importance for both the franchisor and the franchisor. Trademark rights relate to the word and figurative marks used and to the respective Nice classes in which the protection is valid. The ICEZEIT is protected as a word and figurative trademark in various classes. 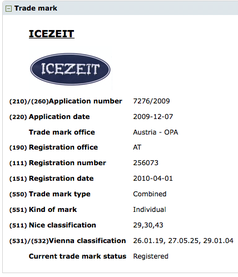 Only ICEZEIT INTERNATIONAL GMBH or ICEZEIT GMBH is responsible for the protection of a country's trademarks worldwide. A franchisee is not allowed to protect the trademark ICEZEIT GMBH or related products in the ice cream sector (see Nice classes above) or to hold any rights for behalf or instead of ICEZEIT INTERNATIONAL or ICEZEIT GMBH. The franchisee may only temporarily have rights under a franchise contract which are regulated by the franchisor. Such rights are, for example, territorial protection rights, rights for sublicensing or the limited use of the trademark ICEZEIT. The franchisee may be granted territorial protection within the framework of the franchise agreement and the respective applicable rights of the country concerned. The franchisee may be granted customer protection within the framework of the franchise agreement and the respective applicable rights of the country concerned. This means that the franchisor has only limited access to the franchisee's customers. All this is regulated in detail in the franchise contract. The franchise contract is - besides other valid laws - the basis of the business relationship between franchisor and franchisee. E Purchasing aspects: Some ingredients and products must be licensed by ICEZEIT INTERNATIONAL GMBH. F Aspects of royalties: The license fee results from the net volume acquired by ICEZEIT INTERNATIONAL GMBH. The franchise manual is a mixture of different media. Basically, the manual is created by the franchisee as part of the training (depending on the target market and the products used). ICEZEIT INTERNATIONAL also provides further folders, brochures and videos. Important areas for the franchisee are specially made available and kept up-to-date in a separate area of the web (extranet). Franchise fees are regulated individually in the franchise contract. Basically there is an entry fee as well as ongoing fees. A distinction is made between local products which can be purchased without a fee on the franchisor and products which must be sold through the franchisor or its distribution channels and which are subject to a surcharge. ICEZEIT INTERNATIONAL strives to purchase and resell products purchased through its distribution channels as cheaply as possible. ICEZEIT INTERNATIONAL positions itself as a quality provider - therefore quality standards and quality control are a particularly important matter. Quality standards are achieved with certified and precisely specified products and formulations. The manufacture of the products with various standardized technologies and devices also contributes to quality assurance. During the training phase, the franchisor is also trained on the quality control parameters. In the franchise contract, the franchisor also reserves the right to terminate contracts in case of non-compliance with quality standards or to prohibit the use of the brand name.